Flammable and combustible liquids require special storage in order to minimize hazards. Safely storing these chemicals begins with identifying hazard classifications and the risks associated with each classification. Illustrated below are key terms and definitions that address flammable and combustible properties. Flashpoint: This is the minimum temperature at which a substance produces enough vapor to create combustion. The lower the flashpoint the greater the danger. Class IA: Having a flashpoint below 73°F and consisting of a boiling point below 100°F. Class IB: Having a flashpoint below 73°F and consisting of a boiling point at or above 100°F. Class IC: Having a flashpoint at or above 73°F and below 100°F. Class II: Having a flashpoint at or above 100°F and below 140°F. Class III: Having a flashpoint at or above 140°F. The SUPERloc series – inside storage room for flammables and combustibles. Storing chemicals inside your facility can create a more efficient process for your operations, therefore advancing your daily manufacturing productions. Safely store your chemicals with a 4-hour fire-rated SUPERloc chemical storage building to keep your hazmat compliant. The SUPERloc chemical storage building is designed for storing flammables and combustibles. Constructed from heavy-gauge steel for superior strength and durability. All SUPERloc series chemical storage buildings feature a 15-year structural warranty and a chemical, weather and UV resistant epoxy-finish for protection against severe weather conditions. 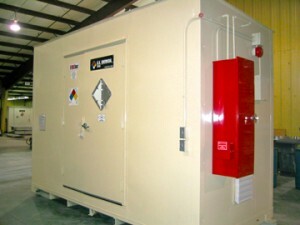 Maintain your hazardous material storage in any climate with our heating and cooling systems. The SUPERloc Inside Storage Room for Flammables Meets Compliance Regulations. Locate your SUPERloc inside storage room for flammables 10 feet away or even inside your facility for faster production, and distribution. Unmatched strength and durability features offer long-lasting use and compliance for managing your chemical storage. Meets EPA, OSHA, NFPA and FM approvals or Warnock Hersey standards. The SUPERloc series is a safe, secure and compliant inside storage room for flammables and combustibles – US Chemical Storage offers protection to personnel, investments and facilities.